Southern Harford County Rotary's 4rd Annual Snowball traveled " Back to the Future!" 30 years ago seventeen year old Marty McFly is accidentally sent back in time from 1985 to 1955 in a time machine built from a DeLorean by eccentric scientist Emmett "Doc" Brown. Marty must then find the 1955 Doc Brown to help him reunite his parents and return to 1985. Not long after Marty returns to 1985 Doc shows up informing him that he and his girlfriend Jennifer's children are in crisis. So once again they hop into the DeLorean and time travel to 2015! 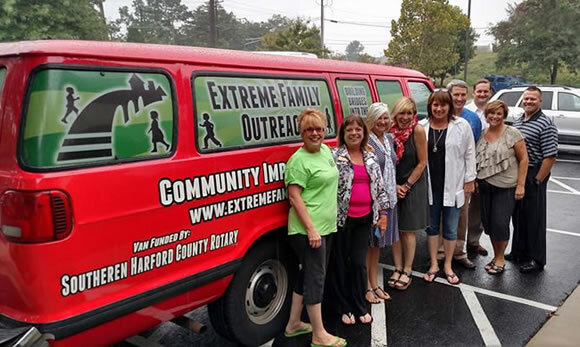 This year's Snowball proceeds go to Extreme Family Outreach, an intensive, community-based 501C3 organization that provides educational and emotional support to children in the at-risk areas of Southern Harford County. The funds were used to purchase a van. All materials and photos, unless otherwise specified, copyright of Southern Harford County Rotary Club. All Rotary marks, logos, and copyrighted content is owned by Rotary International, used with permission.